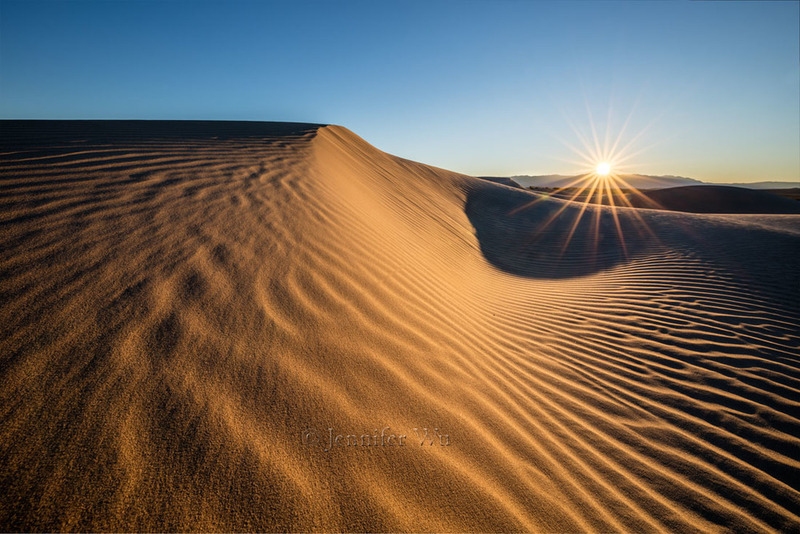 Sand Dunes at Sunrise: Photographed at F/16, 1/100 second, ISO 100, EF11-24mm f/4L USM lens at 11mm, Canon EOS 5DS R. I took five exposures at one f-stop increments and blended using HDR in Adobe Camera RAW. I then took another image with my finger in the area of the sun to reduce sun flare. I took the same five exposures and combined them in HDR. I used this image in a layer mask in PhotoshopCC to reveal the areas without the lens flare. 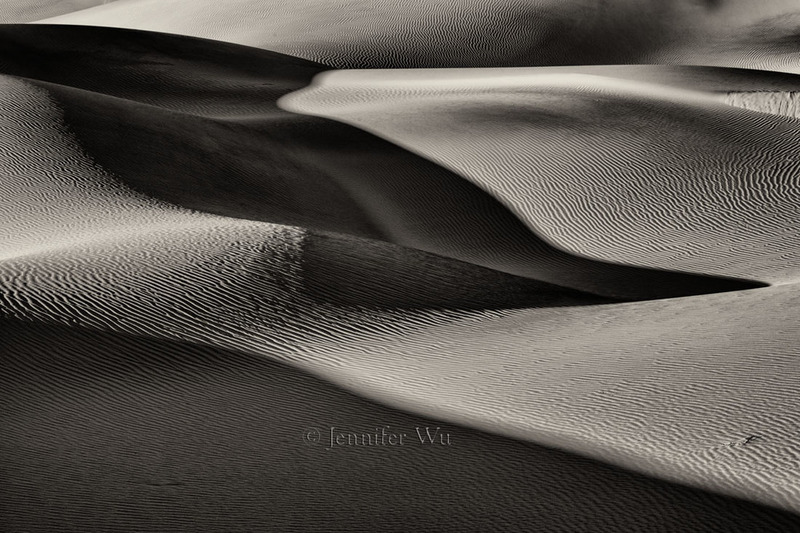 I just finished up the Death Valley workshop and we had an amazing time! I was unsure of what to expect due to the recent floods in the park. All the roads were closed due to flood damage except the main road. It looked like going to some of my favorite places like The Racetrack and Badwater would not be an option with all the water damage! I shifted gears and decided to go to Valley of Fire instead for part of the workshop, but the night before the workshop started, we got news the Racetrack was now dry and we could walk on it! 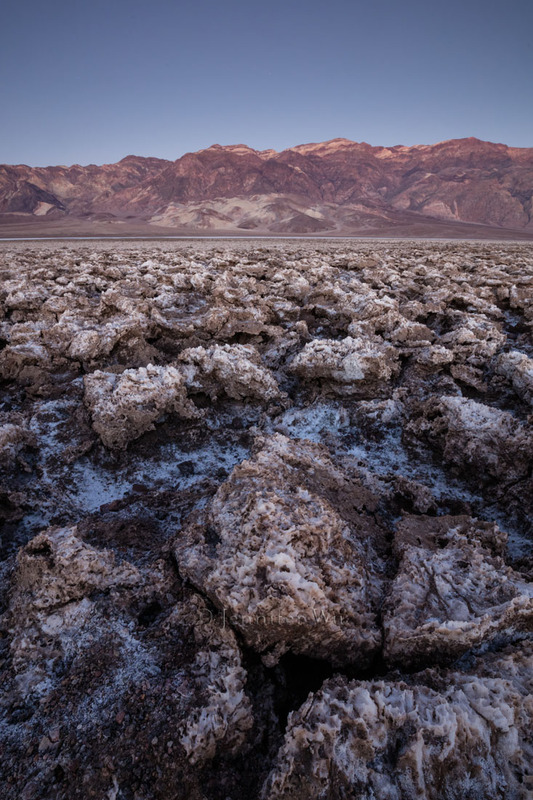 Plus the road to Badwater and Devil’s Golf Course opened up, just in time. The workshop was back on track in Death Valley as planned! We spent our time with lectures on night photography and out in the field photographing the stark, but beautiful landscapes and night scenes. 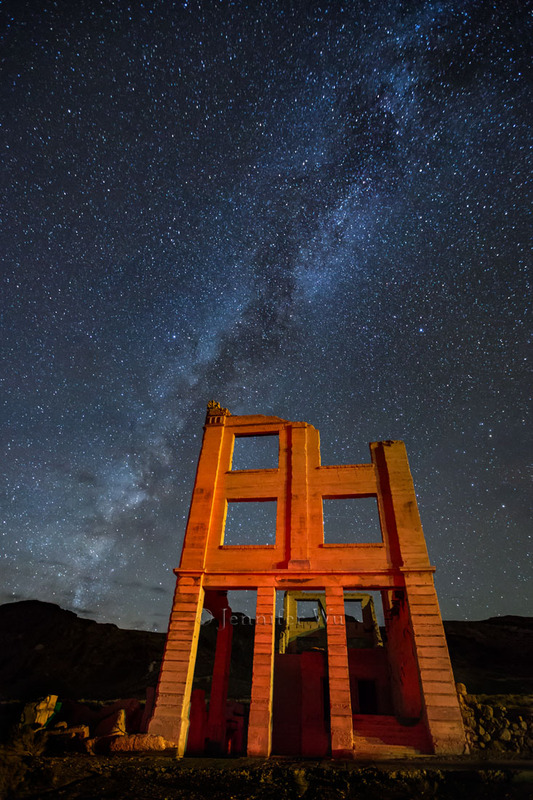 One night, we headed out to the Rhyolite Ghost Town and had a blast light painting the old buildings. We used red, blue and green lights to paint the abandoned town with the stars providing a beautiful backdrop. Out of nowhere, a donkey hee-haws across the street from us. It was so loud! Perhaps it was telling us that we were disturbing its sleep. We finished our night photographing an old car with the stars in the background and then headed back to our hotel for some much needed rest. Rhyolite: Light painting for about 4 or 5 seconds with an orange gel on a flashlight for the back wall and a red headlamp for the interior room. Photographed at F/2, 20 seconds, ISO 2500, EF24mm f/1.4L II USM, Canon EOS 5D Mark III. Bank Building at Rhyolite: I painted with a red headlamp for 5 seconds on the building. Then taking another photograph, I light painted the inside of the building with the red headlamp for about 10 seconds. I combined light painted images with a layer mask in PhotoshopCC. Photographed at f/2.8, 20 seconds, ISO 6400, EF16-35mm f/2.8L II USM at 16mm, Canon EOS 5D Mark III. Star Trails: This is a stacked star trail with fifteen, 4-minuite exposures for at total time of 1 hour. These were combined in PhotoshopCC. 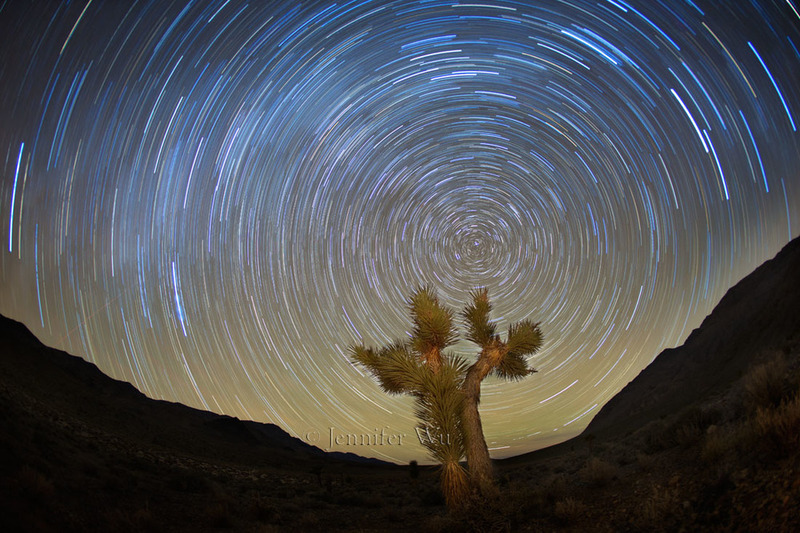 Photographed using an intervalometer set to 4 minutes, f/2.8, ISO 800, 15mm fisheye lens, Canon EOS 5D Mark III. 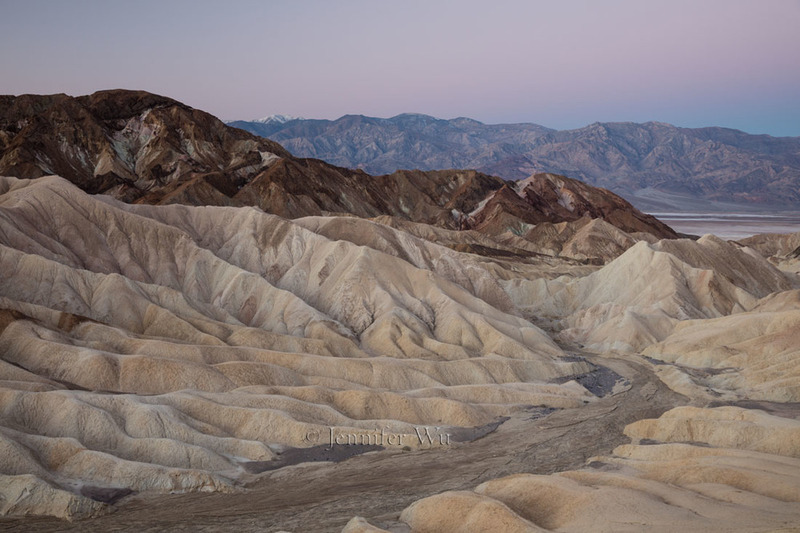 The morning light was beautiful at Zabriskie Point. We enjoyed seeing the pink glow of twilight, known as the Belt of Venus. Watch for the pink glow in the sky about 10-20 degrees above the horizon, just before sunrise or after sunset. 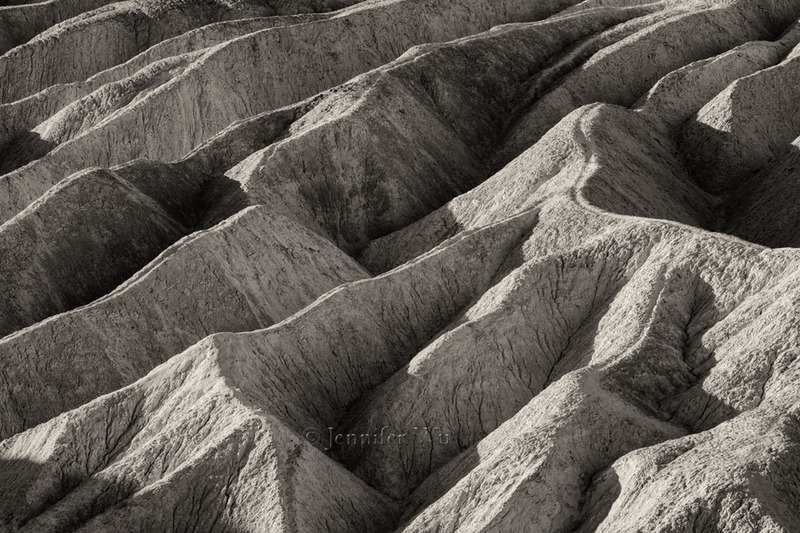 Zabriskie Point: I chose an aperture of f/8 because it is one of the sharpest one the lens. Generally two to three stops from wide open will be the sharpest aperture for the lens. I didn't have a close foreground therefore I didn't need f/16 for more depth of field. Photographed at f/8, 1.6 seconds, ISO 100, EF24-70mm f/2.8L II USM at 28mm, Canon EOS 5DS R.
We took a road trip to The Grandstand and The Racetrack, renting jeeps to protect our tires. It was cold and breezy but we photographed the racing rocks through sunset and then stars, despite the cold! The Racetrack: Photographed at F/16, 1/60 second, ISO 100, TS-E17mm f/4L, Canon EOS 5DS R.
I love the sand dunes. 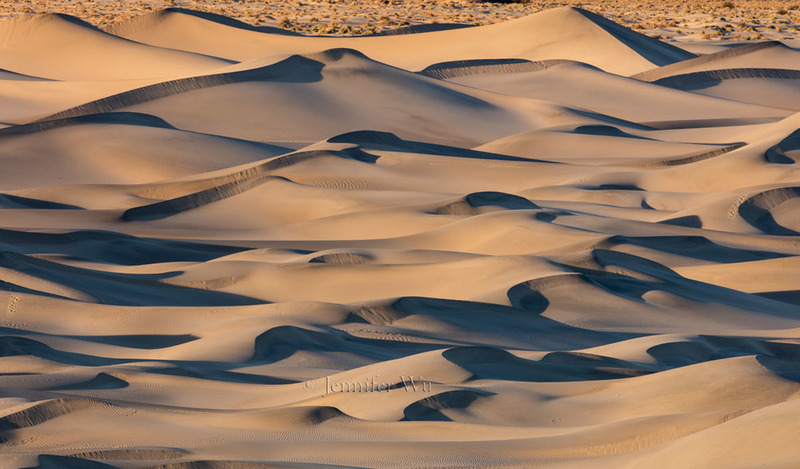 The forms and shapes have endless possibilities for compositions with sand patterns, animal footprints and s-curve shapes. We photographed at twilight and then with the sun, as it rose over the dunes. Sand Dunes: photographed at F/16, 1/30 second, ISO 100, EF11-24mm f/4L USM lens at 12mm, Canon EOS 5DS R. I converted to black and white using Nik Silver Efex Pro2. Our last evening had howling wind gusts throughout the park. We decided to stay inside and did some additional lectures. The following morning was our last shoot. The weather report predicted even stronger winds but it was beautiful and calm. The hexagonal shapes, created by the drying salt, made for a delightful pattern. 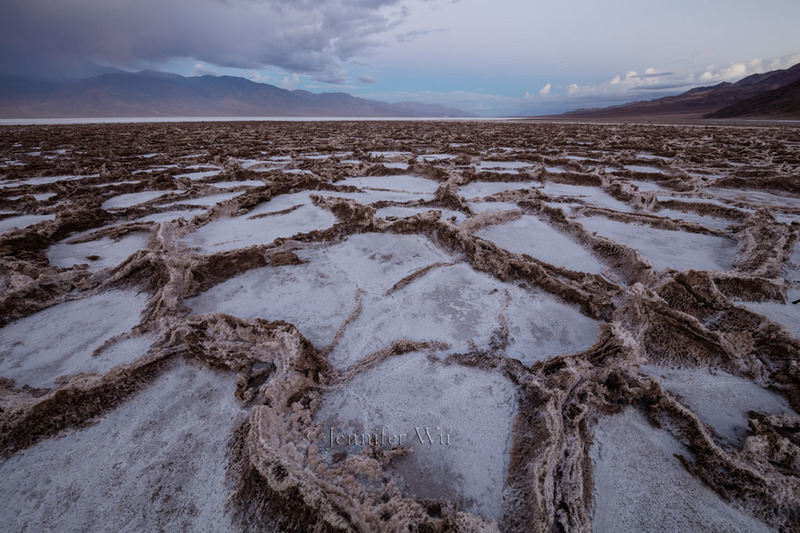 There were storm clouds hanging above Badwater adding drama. We saw some mammatus clouds, meaning breast clouds, that you can see in the gallery of images below. They have a cellular pattern of pouches that are under the base of another cloud. Overall, a great last photographic outing and a wonderful trip! 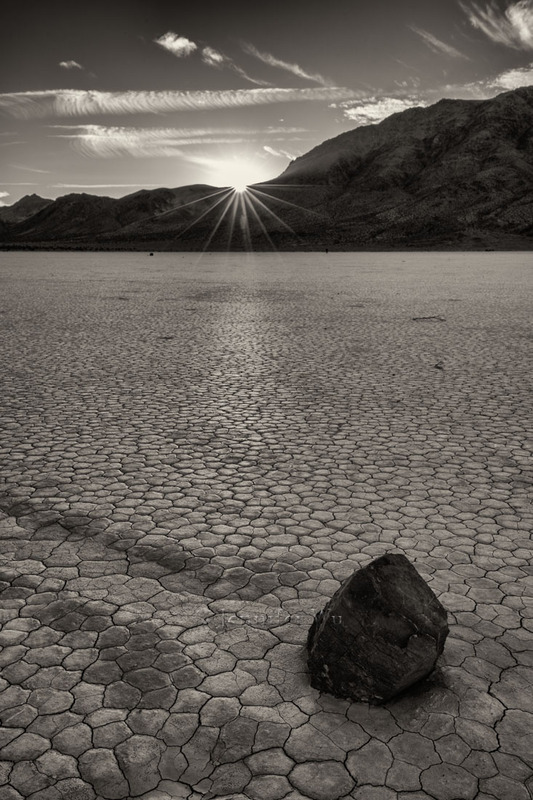 Badwater: I angled the camera downward to emphasis the hexagonal shapes in the foreground. This makes it look larger in the scene. 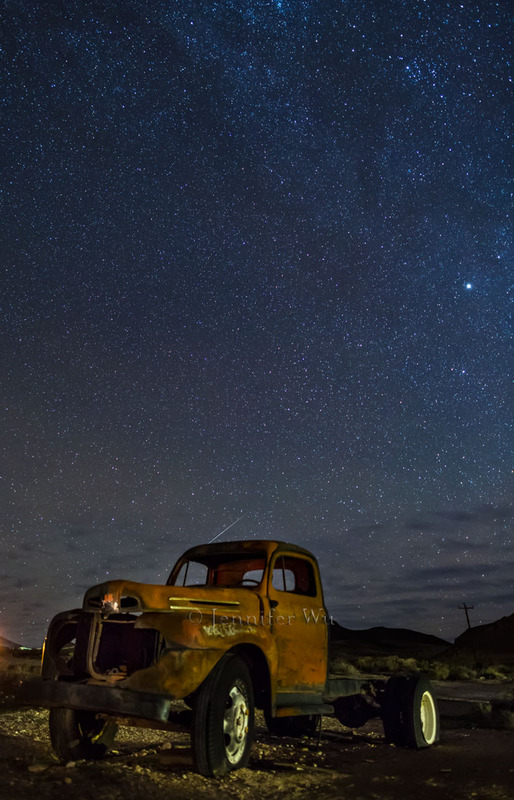 Photographed at f/16, .3 second, ISO 100, EF16-35mm f/4L IS USM at 18mm, Canon EOS 5DS R.
More images from November 2015 Death Valley Workshop. Click on an image below to enlarge.